A chemical nutrient solution should be at 1,000 to 1,500PPM (parts per million) to be on the safe side in most cases, but custom adjustments (i.e. 800PPM) can be made depending upon the plant and stage of growth. 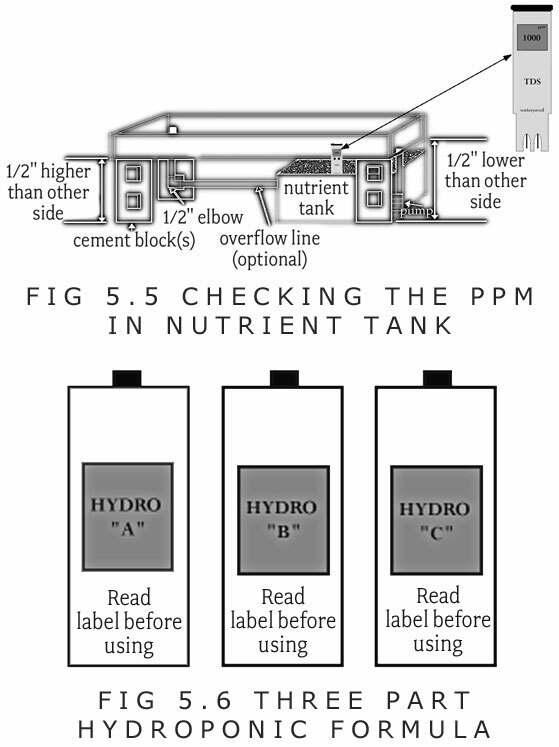 Hydroponic systems that do not recirculate solutions make it much easier to produce precise nutrient levels. 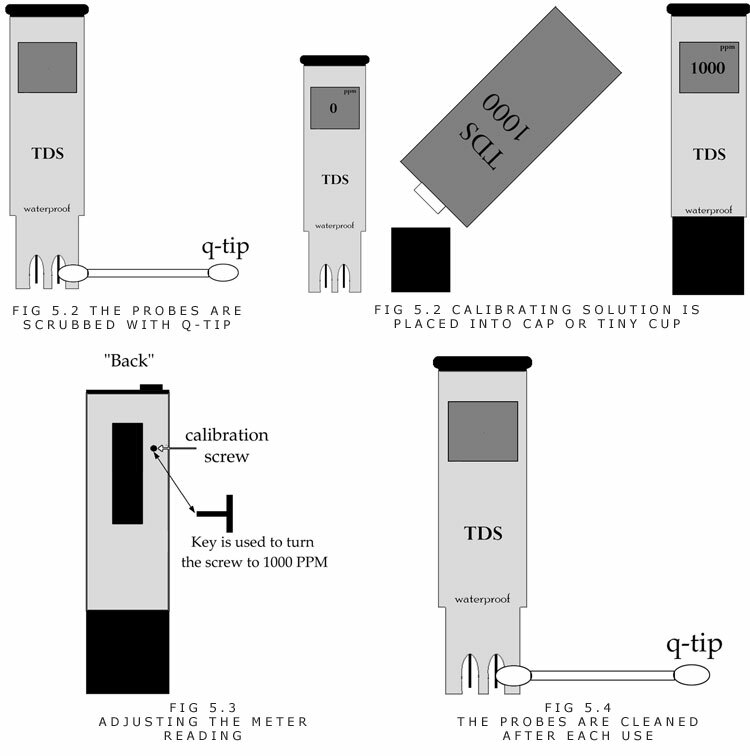 A basic TDS meter (which tests for total dissolved solids) will give a reading in PPM, such as 1,200. Expensive meters measure a large span of elements and can be used to keep all feeding costs to the bare minimum because specific nutrients can be added after they are used by the plants. An organic or a chemical-organic fertilized nutrient solution should be no higher than 1,500PPM. With an organic or a chemical-organic solution, a grower can push the quantity of certain elements in a solution because a lot of the fertilizer will not contain salts that hinder growth when they are in a solution in excess. For example, when Earth Juice Grow and Earth Juice Bloom are used to obtain the desired PPM of nitrogen and calcium, the PPM on a meter would be lower than if a solution of calcium nitrate was used to give the same PPM of nitrogen and calcium. There will be dissolved solids in an organic hydroponic system from sources such as bat guano, Epsom salts (magnesium sulphate), sulphate of potash, humic acid, etc. Some fertilizers will add nutrients, but the PPM meter will not fluctuate. In a nutshell, this is the advantage of many organic fertilizers: they deposit no toxic salts. Results will be excellent if an organic solution is changed weekly, every ten days, or every second week with a good fertilizing formula. A solution can go unchanged for longer periods of time with additions of new nutrients from time to time, especially when plants are small and don’t feed as much. However, since plant nutrient requirements are always changing and some nutrient deficiencies are hard to detect, it is advised that you change the solution regularly to avoid the hassle of determining what plant food is needed and when. Also, just because plants are green doesn’t mean that they are growing at maximum production rate. A system that does not recirculate the nutrient solution is easy to use because the same formula can be made each time the plants get fed. In most systems, 2 quarts (liters) or less per plant is enough of a solution to feed each plant. Plants in a recirculating hydroponic system that uses a pump need more monitoring because pH and PPM will change. A major factor worth noting is that larger reservoirs will have less fluctuations in PPM and pH and will minimize maintenance. Using 5 to 12 gallons of solution is fine for small or large closets during vegetative growth and flowering. Using 20 to 40 gallons of solution would be fine in a bedroom. For example, 20 gallons of solution for vegetative growth would require little maintenance. During flowering, 40 gallons of solution is low maintenance. Young plants tend to use more water than nutrient. Therefore, for the first 2 to 4 weeks, adding plain water to the reservoir is probably all that is necessary because solution will become saline(i.e. 1,800PPM) when a plant takes in water without much nutrient. Until plants start to use a decent amount of nutrient, it is not necessary to do complete reservoir changes, because there will be nutrients that have not yet been used by the plants. 600 to 1,000PPM is adequate for seedlings and vegetative growth. It doesn’t hurt to make a solution on the weak side (i.e. 1,000 PPM) until plants start to use equal parts nutrient and water, because PPM will rise as water is used by the plants. When plants use equal parts nutrient and water, adding 1,000 to 1,500 PPM concentrated solution is recommended. When plants use more nutrient than water, adding a concentrated solution of about 1,500PPM is recommended, unless a stronger concentration is needed to keep PPM at optimal levels. One should try to keep the PPM near 1,500PPM in the reservoir. This way the solution will stay within the 1,000 to 1,500PPM boundaries, even as PPM slowly drops as plants use more nutrient than water. When a reservoir needs changing (i.e. every 1 to 2 weeks), it is a good idea to allow the solution to run low. For example, if a full reservoir is at 1,500PPM, it is possible to allow water and nutrient to lower to a level such as 800PPM. This will give a little flush since the solution is on the weak side. Now there is only a little liquid to pump out of the reservoir before a new solution is added, thus minimizing maintenance. Plants that are close to intense light will use nutrient up more quickly than plants that receive less intense light. When plants do not get the correct doses of food, nutrient deficiencies occur. When a deficiency occurs, leaves normally change color from green to green-yellow to yellow. Deficiencies are often a sign that the reservoir needs a change, or specific elements need to be added to the reservoir. When a deficiency occurs, it is recommended that you give the plants the food they crave (i.e. nitrogen or calcium). Nitrogen is the most common deficiency. Deficiencies should change within a day or two after the proper fertilizer is applied, and plant should go back to a healthy green unless the deficiency caused serious damage. A. The TDS meter electrodes should be rinsed with clean or distilled water, or isopropyl alcohol, then water. A Q-tip helps scrub the electrodes free of debris too. B. Now the meter should be submersed in a calibrating solution (1,000PPM). A small container or the protective cap around the electrodes serves as a place to hold the calibrating solution. C. The calibration dial should be turned until the reading shows that of the calibrating solution (i.e. 1,000PPM). (Figure 5.5) Some meters come with a calibration screwdriver while others need a small screwdriver. D. The electrodes should be cleaned again with a Q-tip and clean water. E. The meter should be dipped in the reservoir after the fertilizer is added. F. Fertilizer or water should be added to adjust the PPM reading to between 1,000 to 1,500PPM. If the PPM is higher than wanted, adding water can dilute the solution to the desired PPM range. The meter is actually useless in determining proper amounts of an organic or chemical-organic solution, but it is a good reference meter. Further in this chapter we will discuss organic formulations, chemical formulations, and how to get the desired PPM of a specific element (e.g. nitrogen) in a fertilizer. Hopefully your water source is near 0 PPM so that water is not stocked with unwanted PPM, which can put limits on the amount of fertilizer that may be added to a solution. There are many relatively inexpensive products, such as reverse osmosis machines and distillation devices, which remove unwanted dissolved solids from a water supply. Note: The PPM readings should only be used as a reference for changing solutions because they do not read the actual parts per million of a solution. Calculating parts per million of a particular fertilizer or element is best done with a little math and chemistry calculation as will be explained on the next page. Most meters are priced under $100. These measure PPM on a scale of 100 (i.e. 100, 500, 1,000, 1,100). For most people, these meters do the deed. However, there are expensive meters that measure a wide variety of elements in a solution. These tools are for experienced hydroponic farmers. The percentage of the element in a fertilizer (i.e. 20-20-20) is needed to determine the PPM. The fertilizer packs are listed as NPK. N is all nitrogen, but phosphorous is listed as a compund (P205), and potassium (K) is listed as K2O. Phosphorous(P) is 44% of phosphoric acid (P2O5), potassium(K) is 83% of Potash (K2O). To get the PPM from a 15-30-15 fertilizer, the first step is to take all three numbers and move the decimal one place to the right. In the case of nitrogen, the number would be 150. This number will give the parts per million of nitrogen when 1-gram is added to each quart or liter. For phosphorous, a grower should multiply the 300 by .44. For example, 300 x .44 = 142PPM. This number will give the parts per million of phosphorous when 1-gram is added to each quart or liter. For potassium, a grower should multiply the 150 by .83. For example, 150 x .83 = 124.5 PPM. This number will give the parts per million of potassium when 1-gram is added to each quart. Advanced Note: Some growers make their own plant food with 5 to 7 basic salts, like those described on pages 196 to 199. Here is how to get desired parts per million of sulphur(S) and potassium (K) in potassium sulphate (K2SO4). A. The periodic table of elements should be referenced in order to get the atomic numbers of each atom. For example, potassium has an atomic number of 19, sulphur has an atomic number of 16, and oxygen has an atomic number of 8. B. Now, to determine the percentage of each element, all the elements must have their atomic numbers multiplied by the number of ions in a compound. In the case of K2SO4, the atomic number of potassium, (K), which is 19, is multiplied by 2 to give 38, because there are 2 potassium ions. Since there is only one sulphur ion, 16 is multiplied by 1 to give 16. Oxygen has four ions in the compound, therefore 8 is multiplied by 4 to give 32. C. Now all of the atomic numbers are multiplied by the number of ions, and all of the atoms multiplied by their atomic weights are added up. For example, the total number in potassium sulphate is (2 x 19) + 16 + (4 x 8) = 86. D. To get the percentage of each element, the amount of ions is multiplied by the element’s atomic number. For example, in the case of potassium, 2 x 19 = 38. E. The amount of ions multiplied by the element’s atomic number is divided by the sum of all the elements multiplied by their atomic numbers. In the case of potassium, the 38 (number of ions x atomic number) is divided by 86 (which equals .44). F. The number multiplied by 100 gives the percentage. For potassium, .44 x 100 = 44%. G. Finally, the percentage number should have the decimal place moved over one place to the right. In the case of potassium, the number would be 440. This number will give the parts per million of an element when 1-gram is added to each quart or liter. In the potassium case, 1-gram of potassium in a quart of liquid will give 440PPM of potassium. Using half a gram per quart will give 220PPM of potassium and 95 parts per million of sulphur. The level of solubility (and purity) in water will make the final say. For example, some solutions and powders will completely dissolve into usable ions, while others will not be soluble in water, hence the elements will not be readily available to plants. For example, gypsum (CaSO4) is not very soluble in water, which makes it almost useless for hydroponics. However, gypsum does break down slowly in soil, where it works fine. All formulas in this chapter are nearly 100% soluble in water. The pH level is the measure of the hydrogen ion concentration in a solution or other medium. There are more hydrogen ions in an acid solution than in a basic solution. On a scale, a pH of 7.0 is neutral, under 7.0 is acidic, and over 7.0 is alkaline. A plant’s intake of certain elements is greatly affected by pH. A. The pH of plain water should be checked before adding the fertilizers. That pH number should be written down where it can easily be found. If the water pH is the same in the future, it is easier to make a quick formula using the same fertilizers without having to measure. B. All of the fertilizers can be added and mixed well. The quantities should be written down for future reference. 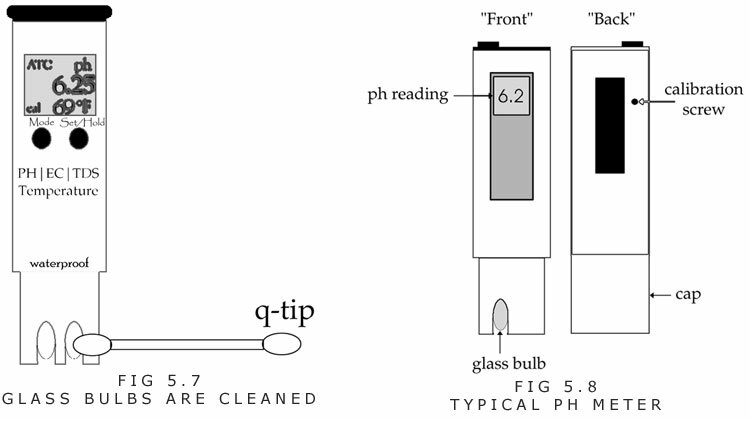 C. A clean pH pen should be calibrated at 7.0, which is the pH reading of the calibrating solution. Calibration instructions are given on page 193. D. The pen should be dipped into the solution and pH up or pH down should be added until the reading is in the 5.5 to 6.5 range. In many cases using chemical fertilizers, the ph will drift down. Therefore, making the ph at a higher number like 6.5 will allow the PH to be in the desired range until it drifts downward. E. The electrodes should be rinsed in clean water before the meter is put away. An example of a pH up product is Greenfire Natural Up. There are endless pH up solutions available anywhere garden supplies are available. Using feeding combinations that don’t rock the pH level means little or no pH up is needed. An example of organic pH down is Earth Juice Natural Down. Vinegar also works fine. There are many brands of ph down available. Writing down the quantity of pH up or pH down that is added (for future reference) is a good method for putting together an identical solution in the future. The pH should be checked daily and adjusted if necessary because many fertilized solutions will drift significantly upward or downward in pH in less than 24 hours. Organic fertilizers tend to drift upward in pH after being mixed, and may continue to do so for a day or up to a few days after the solution is mixed. Adding molasses and avoiding certain fertilizers can keep the upward pH drift in a solution (organic or chemical-organic) to a minimum. Making an organic (or chemical-organic) solution a day or two in advance, with molasses (11/2ml / gallon of water) helps against upward pH drift. If a pH pen is not cleaned after each day it is used, it can be hard to get accurate readings and it may not calibrate to the correct reading, especially if organic fertilizers are used. Using a cleaning solution on it before putting it away helps calibrate the pen accurately. The pen should be allowed to stay moist when it is put away. A few drops of calibrating solution in the bottom cap helps the electrodes stay moist. Cleaning the pH pen with clean tap water and a Q-tip works too, and saves money. When a Q-tip is used, it is recommended that you gently pull the fluff away from the stick so that the soft cotton batting can be moved between tough spaces. Care should always be taken for the glass, because it can break and start to give weird readings without a grower noticing the error. B. The meter should be adjusted by turning a calibration screw so that it reads 7.0. (Figure 5.8) It might need several seconds to reach a stable reading. D. After the pH pen is calibrated, it should be rinsed well with clean water before a reading is taken, and after every reading. In fact, an eye should be kept on the pH of the water that is being used to rinse the pH pen. If the water is good, clean running, cold tap water, the pen will often stay at one number when it is rinsed. 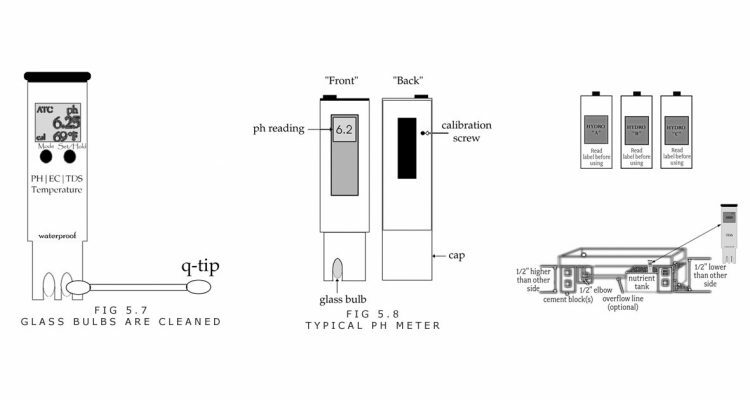 If the pH pen is really clean and calibrated properly, it should stay calibrated for several readings. When the calibration does read differently it is probably because the pen needs a cleaning. If the meter is not clean and it is calibrated, all readings can be inaccurate. Weak batteries can throw off the readings and make the pH pen function at a slower speed.